The TerraNova Test is an achievement test commonly given to students in grades K-12 that measures achievement in reading, language arts, mathematics, science, social studies, vocabulary, spelling, and other areas. The Terra Nova testing is published by CTB/McGraw-Hill and has set the bar for the highest standards in research, item reliability and validity, and technical quality. 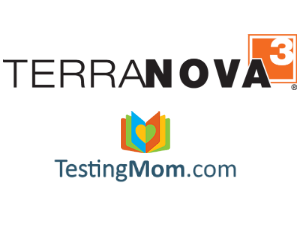 To get started with all of the Terra Nova testing material offered by Testing Mom, check out our 100 Free Questions. The TerraNova offers multiple assessments to measure important higher-order thinking skills as well as basic and applied skills. These assessments generate norm-referenced achievement scores, criterion-referenced objective mastery scores, and performance-level information. The subjects tested on include Reading, Language, Mathematics, Science, and Social Studies. TerraNova Complete Battery provides detailed diagnostic information. This series of assessments generates precise norm-referenced achievement scores, a full complement of criterion referenced objective mastery scores, and performance-level information. TerraNova Survey is an abbreviated version of the Complete Battery and provides a general measure of achievement with a minimum amount of testing time. The Survey generates norm referenced achievement scores, criterion-referenced objective mastery scores, and performance-level information. Finally, TerraNova Plus Tests provide in-depth information about students’ basic skills. Use them to measure important skills in Word Analysis, Vocabulary, Language Mechanics, Spelling and Mathematical Computation. The Plus tests are used for additional diagnostic information about your child. I am a parent of a second grader who just took these tests in Spring of 2018. Where online can I find out comprehensive info on Terra Nova Testing as a whole? I was told second grade does not take the same CSI portion as the other grades? It would be great as a parent for either McGraw-Hill or the school district to be able to provide parents a detailed understanding by grade so we can keep track of our children’s progress. how do I become a member and get study material for my 8th grader? What is a IQ game? Do u have that for 8th graders. You can contact us at help@testingmom.com or call us at 877-609-6203 and a Parent Success Team member will help you sign up! Our IQ Fun pack game is currently only for younger kids, we unfortunately don’t have it for 8th graders. You can view our package options here. If you have any issues, email us at help@testingmom.com, or click help in the upper right of the site to bring up live chat. You can also call us at 877-609-6203. What are graphic strategies in the 3rd grade Terranova?